17th Century Dutch Master Johannes Vermeer is famous for painting like an angel with light. He was a phenomenon, unique in his day with a painting technique cloaked in mystery to our day. Three hundred and fifty years later, we walk into a movie theater and wait confidently to be carried away by an invisible wizard lighting our way in the dark. We expect nuances of color so real, details so explicit and illusions so compelling that the line between our imaginations and what’s up on the big screen disappears. Faux light is at least as real as the light of dawn or evening or in-between. So, it’s easy to understand that a 21st century man could get damn curious about how a man in the 17th century pulled it off. It’s Tim Jenison’s curiosity, hidden out of sight from even his best friends, that comes to light in the Penn and Teller documentary, Tim’s Vermeer. If the noted mythologist, Joseph Campbell were alive, he’d be proud. Tim Jenison is definitely a man who takes heed of Campbell’s famous call to action, “Follow your bliss”. Tim sets out to paint Vermeer’s masterpiece, “The Music Lesson”, and using a camera obscura device in tandem with a small mirror to project and paint images, he does what he believes Vermeer discovered mid-1600’s. He committed his time and a lot of hard work to replicate paints, furniture for an actual room like the one Vermeer painted in and the equipment he believes Vermeer used. 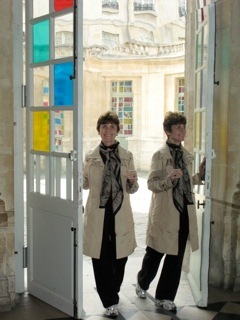 Tim is no painter but he is an inventor of tools of light that give us sensations of vibrancy. He founded NewTek, a company that makes affordable desktop video-production tools. With deep pockets and enterprising friends, he set off on a quest for the secret behind Vermeer’s masterpieces. He proceeded from hypothesis to “Aha” to experimentation, even getting one of his ideas in the bathtub. He still has the water-splotched sketches of what he was guessing. And mistakes, like fabled inventors before him, figured well in his pursuit of how things might have worked for Vermeer. There’s an old saying that genius is in the details. Never has there been a greater truth. As Tim’s story unfolds, his journey of discovery and accomplishment is a fascinating revelation of detail and a tour de force. And, it would appear, Vermeer got there first. It’s very likely that Vermeer discovered the secret to reproducing light on a canvas as seen in the world around him by capturing it as a camera would, pinpoint by pinpoint. By watching Tim reproduce the effort to reproduce one painting of Vermeer is enough to suggest that Vermeer lived in some enthralled state of being. The work is too demanding for an ordinary soul. When Tim shows David Hockney how he paints as Vermeer might have with a mirror while he matches colors, Hockney welcomes his research. As a master artist in his own right who’s recently been painting on an iPad and written a controversial book about the use of optic machines in painting, Hockney shares Tim’s hypothesis that artists use optical tools. Later, when Tim is looking for evidence that he’s on the right track, he makes good use of Hockney saying, “All paintings are documents.” A detail of Vermeer’s painting keeps Tim going when he’s in doubt. When a seasoned mind and technology meet, sparks fly. What Tim seems to have discovered is that Vermeer invented a technique to further his vision and give us a wonder for the ages. 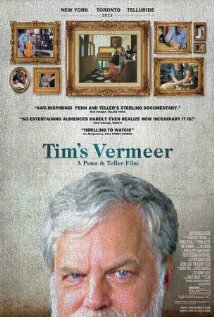 The critics of this documentary seem to exemplify an occupational hazard, attacking Tim’s quest as belittling Vermeer as some sort of technician. Far from the source of creativity, they just don’t get it. Hockney lauds artistic genius and applauds Vermeer with absolutely no disclaimer for any mechanical device involved. But it’s Tim, waxing eloquent about Vermeer’s effect on him after he sees the original of his copy in Buckingham Palace, who makes us realize there’s no substitute for the real thing. Would that we could all see it! In the hands of Penn and Teller, the making of Tim’s Vermeer is delightful, endlessly interesting and inspirational. The documentary shows what’s possible when an idea is pursued with a big heart and lots of focused energy until the only thing left to do is shed tears of joy and praise the genius of humankind! I’m sold. It’s in my Netflix queue.